Showing results for tags '1.4 16v'. Been offered a refurb Bosch Alternator with 2 year warranted for AFH 1.4 16V 1998 Can someone please check part number and also the info below. Part no: 021903017A Voltage (V) 12 Amperage (A) 90 Rotation CW Pulley Type Fixed Pulley Grooves 6 Plug Code 25 thank you. Misfire only at idle after few minutes. i'm new to this forum lark but here goes! 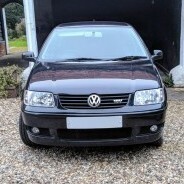 i'm Josh i'm 19 and driving a 6n2 1.4 16v which i bought back in February, it was a bit mechanically ratty when i bought it but after plenty of hard work the mods have started! As i bought the car! The first mod that was completed by myself was the deep dish Steering wheel and boss which I bought off a pair of brothers, one which had a mentally modded 6n, who had the boss, and one who currently owns a mark 2 Breadvan, who the suede steering wheel is from! I bought the Klutch SL1 around two weeks ago, i'm currently fitting it with camber bolts (for the front) and camber shims (on the back) for that nicer fitment! Hope to all see you at the Polo show!